A few months ago I read The Book Thief by Markus Zusak, which recently was a Michael L. Printz Honor Book, an awrd for excellence in young adult literature. The book was first published for an adult audience in Australia where Zusak lives, but ever since Harry Potter, best seller lists like those at the New York Times classify any book that stars a child as its protagonist as a “Children’s Book.” Never mind that the book is over 500 pages long and full of heavy, mature themes like war and death and the Holocaust. Oh no, says the New York Times. If the story is about a child, it must be FOR children. I just shake my head. Dumb dumb dumb. An author friend of mine explained to me why books are classified this way and Harry Potter is indeed to blame. When those books were released, they so shattered the sales numbers of other books and remained on bestseller lists for so long that publishers began to complain: How can we market OUR books as bestsellers if seven of the places on bestseller lists are taken by this blasted Harry Potter fellow? And so The New York Times conceded and put “children’s” books like Harry Potter into a category all their own. Poppycock! Adults read these books probably even more than children do. But alas, this isn’t a blog entry on the unfair treatment YA books receive, nor even an entry about The Book Thief, which I must say is a disarmingly beautiful and tragically wonderful story. If you can stomach a book narrated by Death about a young German girl and her family’s struggle through war-torn, whacked-out Germany, than this, my good friend, is the book for you. Read it. But be warned. It’s sad. You’ll cry and stuff. And yet it will lift your spirits and remind you how precious and glorious life really is. 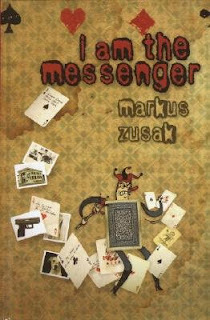 Which brings me to I Am The Messenger, my second Zusak book, which I just finished listening to on audiobook. Like The Book Thief, Messenger leaves you breathless and moved. It too was honored by the Michael L. Printz Award, but only received an honoree recognition, not the actual prize, though I can’t fathom how any book could have beat it. It’s quite possibly the most beautiful story I’ve ever read. Seriously. I’m not throwing this praise casually, people. Mr. Zusak has a gift. Read this book. It will leave you befuddled at times, wondering what in tarnation is going on, but it never frustrates. It moves well, casually at times, but never at a leisurely stroll. And when the hero acts and delivers his message, Zusak holds you so tight, you can’t put it aside. Usually I only listen to audiobooks when I drive, but I so caught up in messenger, I often found myself sitting in the living room with my iPod earbuds in, dyiing to know what happens next. It’s a simple story. Ed Kennedy, a nineteen-year-old good-for-nothing cab driver, is wasting his life away. He didn’t go to university like his brother and has about as much ambition as his old, lazy, foul-smelling dog, The Doorman. When Ed thwarts a bank robbery one day and becomes a local hero, a playing card appears in his mailbox: an ace with three addresses written on it. Somehow, Ed realizes that at these three addresses people need his help. He doesn’t know how he’s supposed to help them or even who exactly he’s supposed to help, but he sets off nonetheless. Sounds silly, right? Maybe like a pilot idea for a new series this fall on ABC. Trust me. It’s more than that. If Messenger doesn’t move you, your heart has stopped beating. This is the kind of book that will motivate you to be a better person. As corny and cliche as that may sound, that’s what Messenger will do: make you believe in yourself.